Your privacy is important to us. To better protect your privacy we provide this notice explaining our online information practices and the choices you can make about the way your information is collected and used. To make this notice easy to find, we make it available on our homepage and throughout our website. 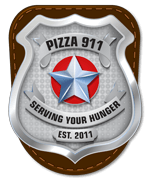 Pizza911NH.com does not actively track you as an individual. We use the information you provide about yourself to respond appropriately to your inquiry. We do not sell or share this information with outside parties. You can register with our website if you would like to receive our newsletter as well as updates on our new services. Should you have other questions or concerns about these privacy policies, please contact us at info@pizza911nh.com. Apply today, we're hiring at all locations!